The regular season is over and it ended anticlimactically for UMD. The Bulldogs came into the weekend knowing that they could finish no lower than second. 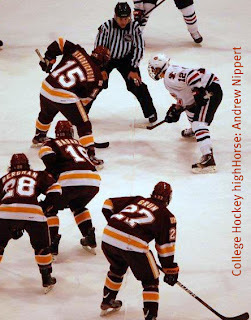 With their tie Saturday, the tie breaker over Denver was not needed as UMD won second outright even with the Denver sweep at Nebraska – Omaha. Conversely, the Bulldogs weekend opponent, Saint Cloud State, had a very thrilling end to the regular season. The drama stemmed from the Huskies run at the end of the season to gain home ice. The thrilling and technology laden finish to Saturday’s game is documented by USCHO. In the end, the tie was all that SCSU needed to gain home ice. UMD had the chance at their own dramatics with the chance to tie for, or win outright, the WCHA Championship. As it turns out, the best they could have done is tied the Gophers, but that still would have been a WCHA Championship. But flat-out, the Bulldogs were fortunate to leave Saint Cloud with one point. The Bulldogs started both games flat and fell behind in both. UMD did step up their play both nights, but it wasn’t sustained for more than half a period. The one area where the ice size was not a factor was at the faceoff dots. UMD won over two-thirds of the faceoffs for the weekend. It was definately a bright spot for the team and a good way to turn the offense around when the playoffs start. The most disappointing part of UMD’s play on the weekend was their special play. Many times it looked as if the Bulldogs had never played on an Olympic sized rink. They took bad angles to start the breakout on the boards, misplayed SCSU players coming into the zone and weren’t ready or able to cover all Husky players. In all cases, they looked bad. It is hard to believe that 15 feet extra width can make that much of a difference. Many of us at the games talked it over and time and time again it came back to bad angles led to missing the play or defensive breakdowns for the Bulldogs. The good news is UMD will not play on an Olympic sized rink the rest of the season. The bad news could be that the Bulldogs still have not been able to recreate what they had going earlier in the season. But it is the end of the regular season and it is time to focus on the second season, the playoffs. Mankato to Duluth Next. Mankato is one of three teams UMD played four games against this season and now they will face off again in a best-of-three in Duluth. UMD won the season series 3-0-1 and were 2-0-0 in Duluth. Mankato is coming in after being swept by North Dakota last weekend.